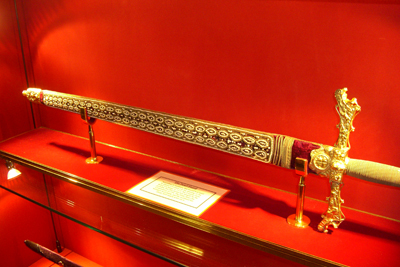 One of five City of London swords, tradition holds that the sword was given to the City Corporation by Queen Elizabeth I when the Royal Exchange opened in 1571. 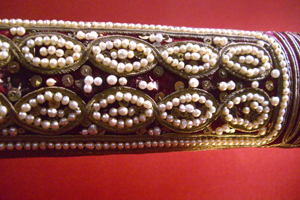 It takes its name from its pearl-encrusted scabbard – there’s said to be 2,500 of them sewn onto it – and was traditionally used in celebrations. These include a ceremony which takes place when the reigning monarch comes in State to the City. Seen during last year’s Diamond Jubilee celebrations, the ceremony involves the Lord Mayor taking the sword from the Sword-Bearer and offering it hilt-first to the monarch to touch – a symbol of the monarch’s authority over the city. It is then borne aloft in front of the monarch by the Lord Mayor. Interestingly, the tradition of the monarch touching the sword hilt is said to date from the reign of King Charles I when the king entered the City in 1641 and just touched the sword given to him and handed it back to the Lord Mayor. Prior to that, the sword was handed over to the sovereign for the during the visit. The City’s other four swords include the State Sword, the Mourning Sword, the Old Bailey Sword and Mansion House Justice Room Sword. 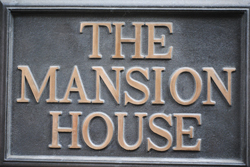 Guided tours of Mansion House – official residence of the Lord Mayor of London and where the Pearl Sword can be seen – are conducted on Tuesdays at 2pm (although it’s closed for August for refurbishments and on selected dates after that). Head here www.cityoflondon.gov.uk/mansionhousetours details. 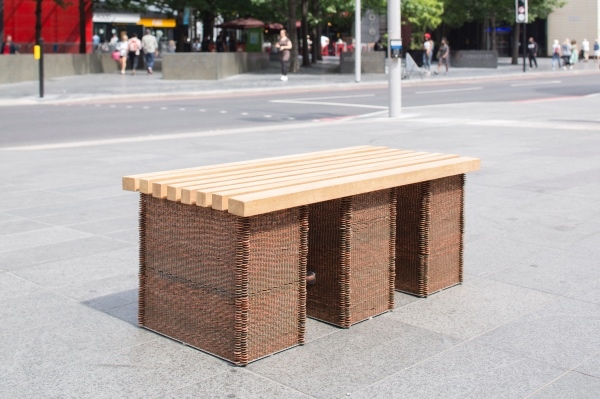 PICTURES Courtesy City of London. Images from the Museum of London’s Streetmuseum app give a glimpse into London’s past – in this case, its wartime history. The image above, taken by Police Constable Arthur Cross, official photographer of the City of London Police, and his assistant PC Fred Tibbs, shows bomb damage at Bank Underground Station, following a direct hit on 10th January, 1941. An estimated 111 people who had been sheltering in the Tube died, some of them thrown into the path of an incoming train. 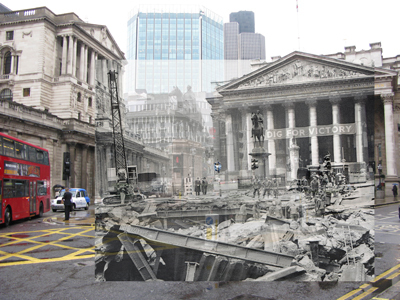 The crater that was left outside the Royal Exchange was so large the Royal Engineers had to build a bridge across it. For details on how to download the app, head to www.museumoflondon.org.uk/Resources/app/you-are-here-app/home.html. 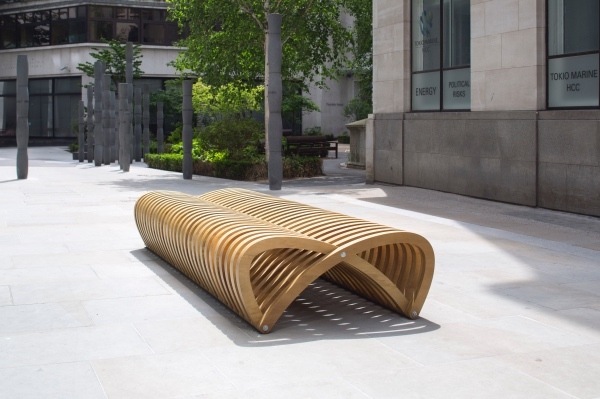 PICTURE: © Museum of London/By Kind Permission of The Commissioner of the City of London Police. The founder of Lloyd’s Coffee House, Edward Lloyd – who died 300 years ago this year – is perhaps not so much famous in his own right as for the fact his name lives on in the Lloyd’s insurance business today. Lloyd is believed to have been born around 1648 but little is known of his early day (it’s thought he may have come from Canterbury). By 1688, he was the proprietor of a licensed coffee house in the now long gone Tower Street and was living nearby with his wife Abigail (the first reference to the coffee house dates from 1688). In 1691, the coffee house moved to a premises at 16 Lombard Street – not far from the Royal Exchange – and it’s here that the coffee house gained a reputation as the centre of the ship-broking and marine insurance business (a blue plaque marks the site today). Lloyd, meanwhile, was building up a network of correspondents at major ports around the world, and according to Sarah Palmer, writing in the Oxford Dictionary of National Biography, was also involved in the publication of a weekly news sheet featuring shipping-related news – initially published on a Saturday, it became a Friday publication in 1699 and continued until at least 1704 – and the rather shorter-lived single sheet newspaper Lloyd’s News, founded in 1696. (Lloyd’s List wasn’t founded until well after Lloyd’s death in 1734). Lloyd and his first wife had at least nine children, with four daughters surviving into adulthood – it was the youngest, Handy, who with her first husband William Newton (he was head waiter at the coffee house and married her just prior to her father’s death) and, following his death, her second husband Samuel Sheppard, continued the family business after her father’s death in 1713. Following Abigail’s death in 1698, he married Elizabeth Mashbourne and after her death in 1712, married again – this time to Martha Denham. 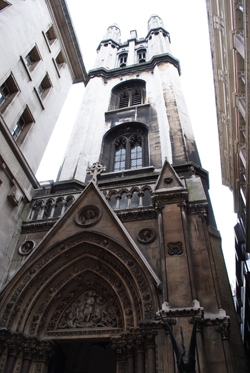 Lloyd died the following year on – 15th February 1713 – and was buried at St Mary Woolnoth – a church at which he’d held positions when alive. 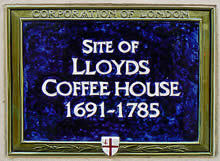 The business which grew to become the Lloyd’s of London insurance business we know today, meanwhile, took its next step forward in 1769 when a group of professional underwriters established New Lloyd’s Coffee House in nearby Pope’s Head Alley. The group, formalised into a committee, later moved to the Royal Exchange and dropped the word new. Lloyd’s was incorporated in 1871 by an Act of Parliament and has gone on to become one of the world’s most famous insurers. It now operates in more than 300 countries and territories worldwide. What was to become Lloyd’s Register, meanwhile, was founded in 1760 as the Society for the Registry of Shipping. 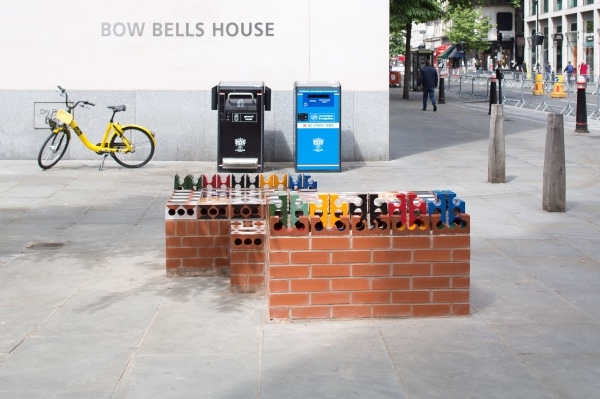 Where’s London’s oldest…higher education institution? While higher education may something we generally associate with more recent historical eras, London’s oldest higher educational institution in fact was founded in the dying years of the 16th century. 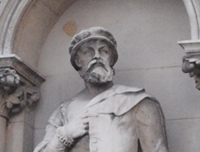 Gresham College was founded in 1597 by Sir Thomas Gresham (pictured, right) – son of Lord Mayor Sir Richard Gresham and the man behind the construction of the Royal Exchange (see our earlier post on Sir Thomas Gresham here) – according to instructions in his will (Sir Thomas died in 1579). Under the terms of the will, part of his estate was left to the City of London Corporation and the Mercer’s Company and it is these who founded the organisation according to his request and still operate via the Joint Grand Gresham Committee. According to the will’s terms, the corporation were to appoint professors in divinity, astronomy, geometry and music while the Mercer’s Company were given the responsibility of appointing professors in law, physic and rhetoric (a chair in commerce was added in 1985). There are also currently a number of visiting professorships. 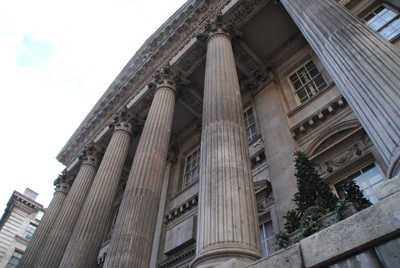 The college – which was founded to provide free public lectures on subjects of scientific interest – is governed by a council with the Lord Mayor of London as its president. Sir Thomas’ mansion in Bishopsgate (now the site of what was formerly known as the NatWest Tower) was the college’s first home. Professors, whose salaries were met by rental income from the Royal Exchange, continued giving lectures there until 1768. Various locations around the city were later used for the college before the opening of a new college building in Gresham Street in 1842. 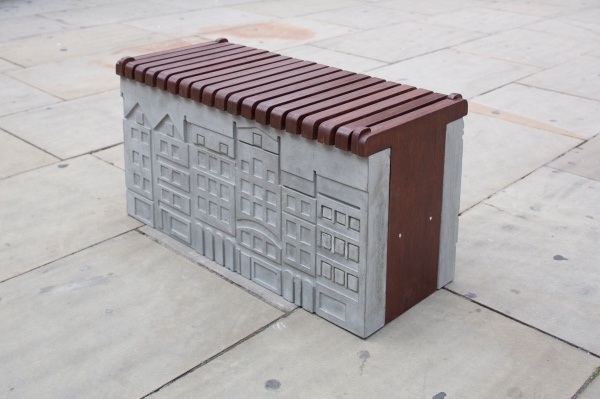 It moved again in 1991 and is now based at Barnard’s Inn Hall in Holborn. Among the professors who have held chairs at the college are architects Sir Christopher Wren (astronomy) and Robert Hooke (geometry) as well as Richard Chartres, current Bishop of London (divinity). The college, which doesn’t enrol students as such and doesn’t award degrees, continues to provide more than 100 free public lectures every year and is also involved in running seminars and conferences and other initiatives. For a detailed history of Gresham College, check out Richard Chartres’ and David Vermont’s book on the college’s history – www.gresham.ac.uk/greshamftp/historygreshm_bk2.pdf. For more on the college and its programme of events, see www.gresham.ac.uk. Lectures are available online. Well done to Carol, this bust – yes, of Abraham Lincoln, 16th President of the United States – is located just inside the ‘rear’ entrance of the Royal Exchange in the heart of the City. The work of Irish-American sculptor Andrew O’Connor, it was carved from a block of limestone apparently quarried near the President’s birthplace in central Kentucky. The bust, which shows Lincoln is his prime, was presented to The Gresham Committee by the Lincoln Committee in 1930. President Barack Obama has been in London for the past two days, so Exploring London decided to take a break from our series on King James’ I’s London and instead, in honor of the president’s visit, take a look at where you’ll find some other US presidents in London. First up, it’s President George Washington. A life-sized statue of the first US president stands outside the National Gallery on the north side of Trafalgar Square. It’s a replica of an eighteenth century marble statue by Jean Antoine Houdon which stands in the State Capitol building in Richmond, Virginia. A gift of the Commonwealth of Virginia in 1924. Civil War President Abraham Lincoln stands looking toward Parliament Square and the Houses of Parliament (pictured). 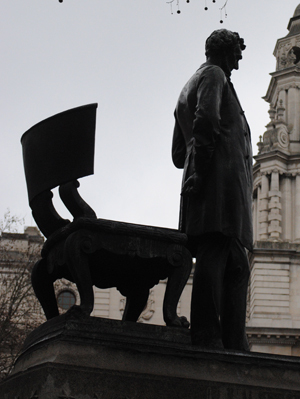 The statue dates from 1920 – it was originally proposed to put a statue of President Lincoln in Parliament Square to mark the 1915 centenary of the last time the US and Britain were at war but the plans were put on ice until several years later. The statue, a gift of the US government, is a replica of the Chicago Lincoln Memorial by Augustus Saint-Gaudens. 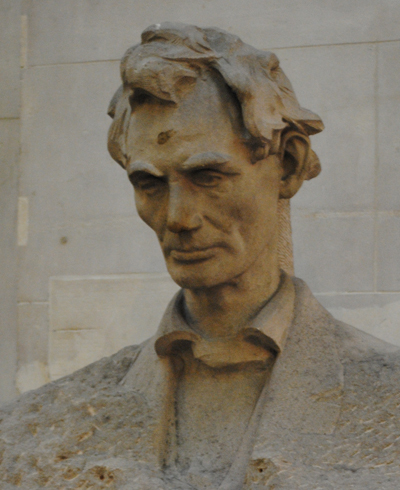 (There is also a bust of Lincoln inside the Royal Exchange building). Next in the chronology is President Franklin D. Roosevelt, whose statue can be found on the north side of Grosvenor Gardens (overlooked by the vast and soon-to-be replaced US embassy). This bronze was unveiled by the president’s wife, Eleanor, on the third anniversary of FDR’s death- 12th April, 1948. The statue depicts the president standing – apparently at Mrs Roosevelt’s insistence – instead of seated in a wheelchair. Across the gardens stands another wartime president, President Dwight D. Eisenhower. A bronze by sculptor Robert Dean, this life-size statue was the gift of the US city of Kansas in 1989 and was unveiled by British PM Margaret Thatcher and US Ambassador Charles Price. It stands only a short distance from Eisenhower’s wartime HQ. (Grosvenor Square has also been home to then future US President John Adams who lived at number nine as the first US Ambassador to the Court of St James between 1786-97). A bronze bust of the 35th president, President John F. Kennedy, can be found on the corner of Park Crescent and Marylebone Road. Unveiled by his brother, Senator Robert Kennedy, in 1965, it’s a copy of a bust located in the Library of Congress in Washington DC. Among those mooted for the future is one of President Ronald Reagan (also in Grosvenor Square), planning permission for which was granted by Westminster City Council in 2009. 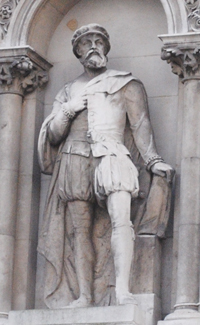 Remembered primarily for having founded the Royal Exchange as a centre for commerce in London and Gresham College, Sir Thomas Gresham was one of London’s leading merchants and financiers and an important advisor to successive monarchs during the sixteenth century. Gresham was born in Milk Lane, London, to merchant Sir Richard Gresham (himself Lord Mayor of London in 1537-38) around 1518-19. He studied at Cambridge before being apprenticed to learn the family trade with his uncle, Sir John Gresham. In 1543, he was admitted to the Mercers’ Company and subsequently spent time in the Low Countries, residing principally in Antwerp and acting as an agent for King Henry VIII. In 1544 he married Anne Fernley, widow of another London merchant. He also had a house in Lombard Street at this time. Sir Thomas became an important advisor to King Edward VI, helping him alleviate financial concerns, a role he continued to play during the successive reigns of Queen Mary I and Queen Elizabeth I (although he spent some time out of favor during Mary’s reign). Knighted for his services to the crown in 1559, he proposed to built his ‘exchange’ in 1565, offering to pay for it himself if the City of London and Mercers’ Company provided the land. Modelled on the bourse in Antwerp with a trading floor and shops and offices set around a large central courtyard, it was officially awarded the title ‘royal’ by Queen Elizabeth I in 1571. Sir Thomas died suddenly in 1579, apparently of a heart attack, and left the majority of his wealth to his widow but included clauses in his will stating that after her death rents from the Royal Exchange be used to create a college which would see seven professors offer free lecturers on subjects ranging from astronomy and geometry to rhetoric and divinity. Known as Gresham College, it became the first institution of higher education in London when it was founded in 1597 and was initially based at Sir Thomas’ mansion in Bishopsgate (it’s now based in Barnard’s Inn Hall and, as it has for the past 400 years, still offers free public lectures). In 1666, Sir Thomas’ Royal Exchange burnt down along with much of London but it was rebuilt immediately afterward (King Charles II laid the foundation stone of the new building) and rebuilt again following another fire in 1838 (at the time the building was largely occupied by two insurance companies, one of which was Lloyds of London). It’s this third building, designed by Sir Thomas Tite to resemble the original plan, which stands on the site today. 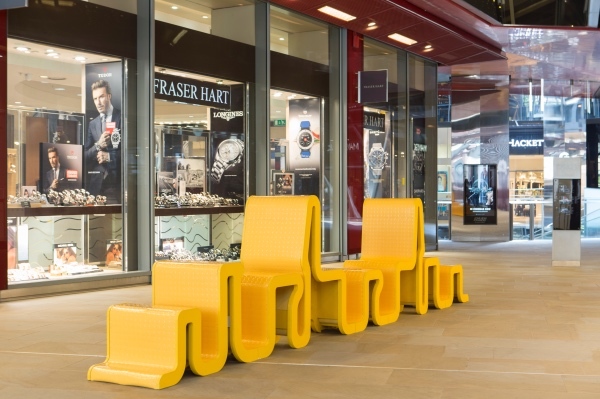 While trading has long since ceased there – it’s now a luxury-end shopping centre – Sir Thomas’s symbol, the gold ‘Gresham Grasshopper’, can still be seen on the weathervane. For more information on the Royal Exchange, see www.theroyalexchange.co.uk.